This is a trite issue I know. I chose to use the Lock & Unlocked icon set for display in my Firefox 44.0.2. 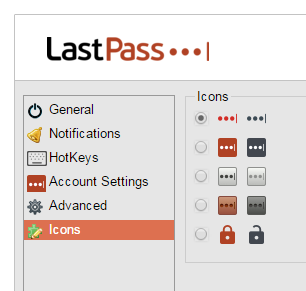 When I login to LastPass the icon displayed is the locked icon. When I logout the icon switches to the unlocked icon. So the icon display is backwards. close and open Firefox but the icon display works backwards. Just a petty annoyance, but that is how it is being displayed. the need for fixing what isn't broken always amazes me with software companies. Well now isn't this sweet. no longer includes the Lock Unlock icon set. The only choices now are those stupid dots that don't help me because I'm color blind. I don't care about your copyright issue as was explained. You mean to tell me you can't design something better then these lame icons. I'm going to UN-install 4.0 and see if I can downgrade to an earlier version. respond to customers wants to often. I don't like the choices you guys are making so far. Edit: Just installed 3.2.42 for FireFox and I have my Icons back. I won't upgrade versions at this point. Well, I think I'll just sit on version 3. I like the interface better. I turned off auto updates which has to be done in the FireFox - Tools - Add-ons - Extension area. LP Auto update selection is not available in the LP preferences menu. Locked = You're logged into LastPass and it's at work, so your data is secure. LastPass is now available for use because I have logged into it, it is now unlocked & ready to go. Obviously the reverse depiction of the locked Lock. If I see a lock on a gate and it is opened I get the impression I can enter through the gate. If the same lock is closed I cannot enter the gate it is unavailable. in the manner which I described above. It just recently started displaying in reverse, hence my original post. Again, just a nit picky item but I liked it the way it used to be. No issues with having new Lastpass icons as such, but for the browser there's definitely an issue that the padlock icon shows as red & locked when in fact I am logged in and should be show as unlocked. Also suggest to keep in mind colourblind people with designing these icons. I have updated my lastpass and selected the padlock icon. When logged in it now shows the closed padlock and when logged out the open padlock. It used to be the opposite. I use the padlock icon for my LastPass icon so that I can easily see if LastPass is logged in or not. Being colour blind the icons that differ only in colour don't help me at all. This used to work fine, with a locked padlock displayed when LastPass was not logged in, and an open padlock when it was logged in indicating that the password vault was unlocked. When LastPass is not logged in I see an open padlock; then when I log in the padlock displays as locked! Perhaps this is an intended change, but it seems entirely counter-intuitive to me, and a definite reversal of how it used to work. Some insight into this change, and even better, a bug report and update would be awesome, thanks!